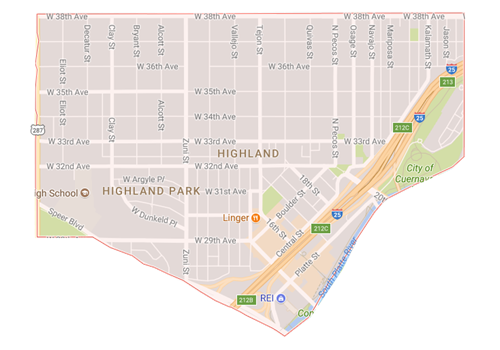 As one of the oldest and biggest neighborhoods in Denver, the Highland community has seen and been through it all. Highland is known for showcasing some of the best cultural diversity in Denver and is undergoing rapid developmental changes that are completely transforming the neighborhood. The Highland neighborhood has Italian, Scottish, German, and English historical influences. This mixture has created a Denver neighborhood that encompasses the American dream. The streets are lined with several family-owned restaurants that feature the best Italian, Mexican, Caribbean, and sushi spots in Denver. Hip shops, martini bars, and book stores make the commercial district along 32nd and 29th Streets a popular place on weekends and lively spot to grab a drink after hours. Currently evolving with a huge housing resurgence, many upscale condos and lofts are under construction in the Highland neighborhood. Real estate options can be found in all price ranges. Historic Victorians mix with single-family homes to create an attractive environment for growing families and business professionals who love the neighborhood's proximity to downtown Denver. Several bridges that connect the neighborhood to downtown have been built over the last 20-30 years. Two attractions that help define the Highland neighborhood are the Tennyson Street Cultural District and the Navajo Street Art District. Here you can visit several art galleries featuring local painters and photographers. You can also catch live music and other performances. The Highland neighborhood is truly one on the most distinctive in Denver. National Geographic Traveler recommends visiting this Denver neighborhood.